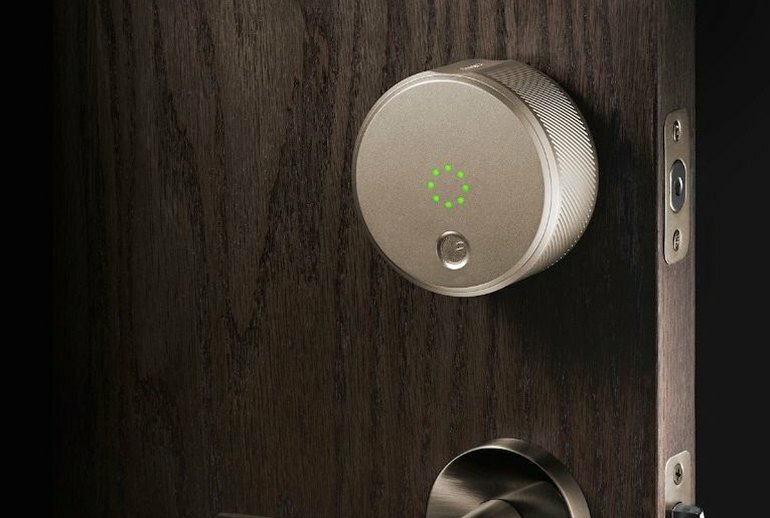 The handsomely designed Bluetooth-connected smart lock retrofits dozens of existing single-cylinder models. 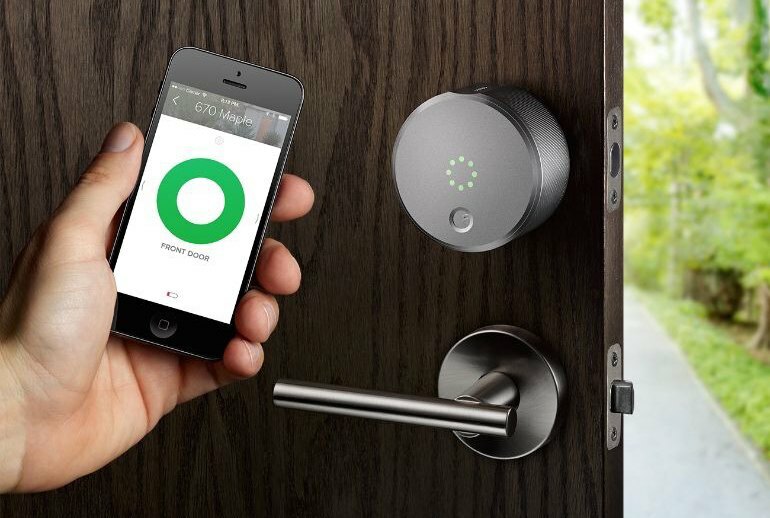 The intuitive iOS and Android apps unlock doors and issue time-sensitive electronic keys. 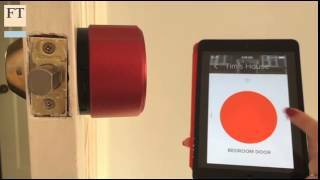 A $50 Wi-Fi accessory enables remote control and integration with Nest thermostats. 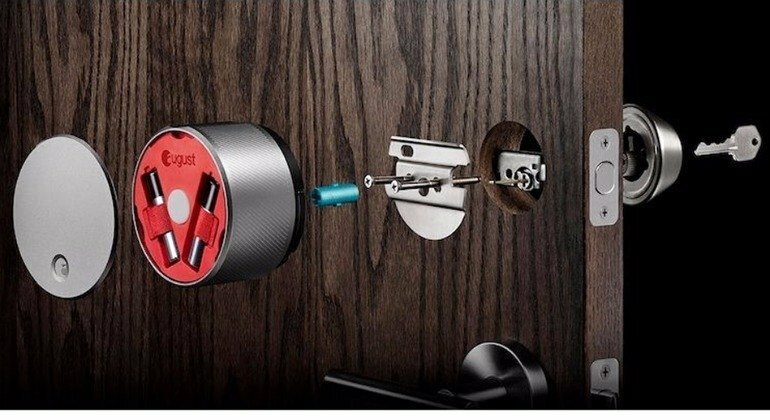 The smart lock is pricey compared to competitors. Some testers found the smart lock buggy and/or slow. 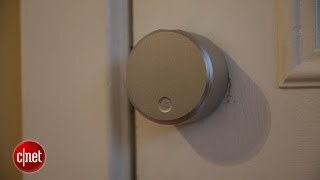 Some testers feel the smart lock is bulky looking. 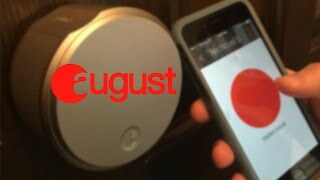 The August Smart Lock controls your deadbolt door lock with a Bluetooth-enabled smartphone app that can also issue time-sensitive electronic keys to family members, friends or authorized visitors (think cleaning lady or dog walker). With the app or key installed, the phone unlocks the deadbolt with a tap on the screen or--with the automatic unlock feature on--as you approach your door. 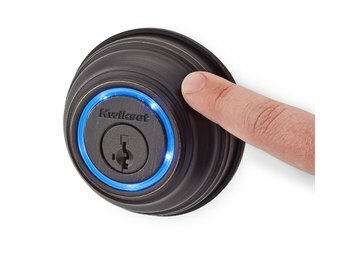 Unlike most digital door locks, which replace your existing hardware, the battery-powered August retrofits the deadbolt you already have--assuming it's among the 100 or so single-cylinder models the device supports. If you can get past the August’s somewhat bulky appearance, there’s a lot to love. 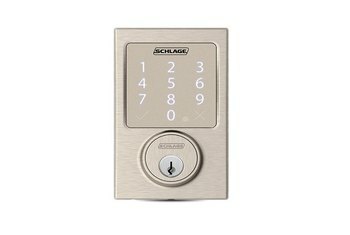 If the lag means you won't likely swap your physical key out for the August and a connected smartphone, this lock still gets enough things right that it's become our new favorite automated door control. 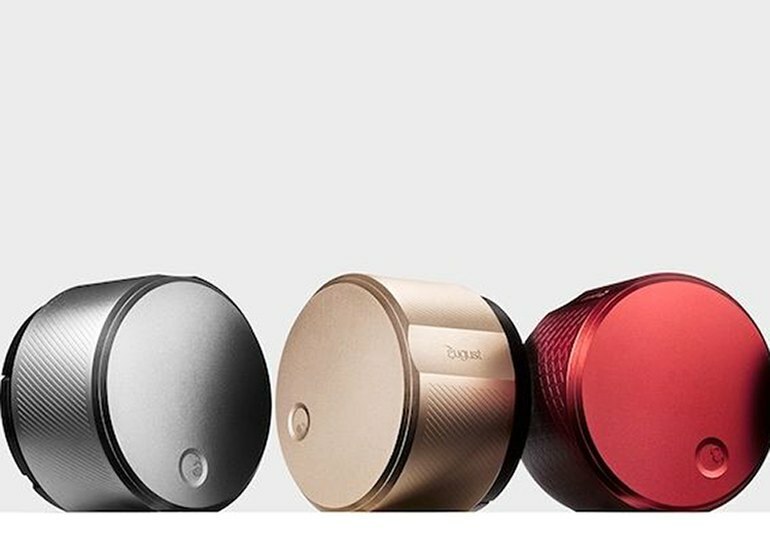 This stylish lock uses Bluetooth technology to communicate with iOS and Android smartphones via an easy-to-use app, which lets you lock and unlock your August-equipped doors, grant access to family, friends, and others, and monitor their comings and goings. 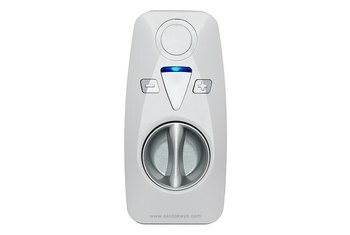 It's a breeze to install and works wonderfully, making it our new Editors' Choice for connected door locks. When buying this you are buying it at as an evolving product that should improve over time. You do need to be careful that your door is properly shut so that it locks properly so the latch must hold the door in place otherwise if it swings open the bolt will lock the door open but still register as fully locked. When this system works, it is sorcery. Unfortunately, it does not always work perfectly. And when you’re talking about something that secures access to your most sacred place, the penalty for failure is incredibly high. While replacing a deadbolt assembly sounds daunting, August makes it really easy. You don’t need to replace any of the internals of your door lock, and your outside-facing lock remains intact throughout the installation. At $250, the August lock is more of a chic bauble than a useful necessity. Consider buying one if you want your door to become a piece of conversation, and if you have disposable cash to burn. I'll give it to you straight: the August Smart Lock didn't work for my family at all. It didn't make any sense to use a smartphone and a big bulky silver dial, when neither it nor its $50 add-on gave us any additional peace of mind. August is the best-designed home technology I’ve used since the Nest thermostat. Free iPhone and Android apps allow you to dole out virtual keys to permanent residents or guests and track their activity. The hardware, which hooks onto many existing deadbolts by replacing the inside-facing latch, took me under 20 minutes to install. Worse, the August didn’t age well, as I discovered over the course of an extended test period. Some weeks after installation, the August would occasionally make an awful grinding sound and not turn the deadbolt at all—sometimes when trying to lock, sometimes when unlocking. Trying a second time would sometimes work—but otherwise I’d have to hope that I forgot to lock the back door. An August lock can tell a Nest Learning Thermostat to relax when your gone and to make the temperature more comfortable when you get home. August is also working toward integration with SmartThings, Logitech Harmony, and others. The architecture of the platform is, I believe, at least as secure as a standard key. However, hardware incompatibilities (in my case, my ancient, out-of-alignment door and my new, shiny iPhone 6) may slow down early adopters. The August smartlock scores some points for ease of use and design, but it also has some caveats, according to at my own success metrics: Is it faster than physical keys? Not really, and certainly not every time. Is it as reliable as physical keys? Definitely not. It’s debatable whether using an app on your phone to operate a dead bolt is easier or quicker than using a key. 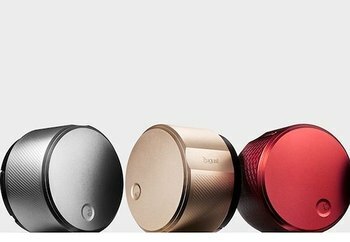 But the guest-key feature, the auto locking and unlocking, and the simplicity of the August Smart Lock make it a promising product, especially for people who frequently give out extra keys. The August worked great for the first few months. But recently, it's started failing to lock and unlock on command -- it sounds like stripping gears inside the mechanism sometimes, and at other times it takes a very long time for the Bluetooth to connect. It seems to me that something like a door lock must be absolutely foolproof -- it has to work 100% of the time without question. August currently works about 60% of the time. I'd hate to be locked out of my house because August wouldn't respond, and that has actually happened a number of times recently.